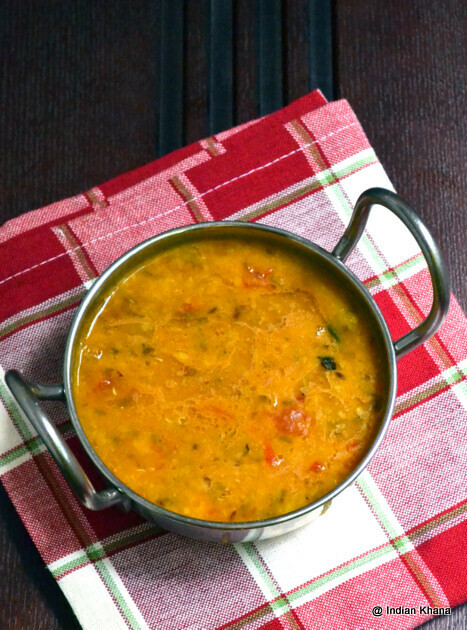 Today I’m posting simple dal takda recipe which can be done in jiffy in the most easy way. It’s similar to my tindora dal where I add everything, pressure cook and then give a simple tadka. 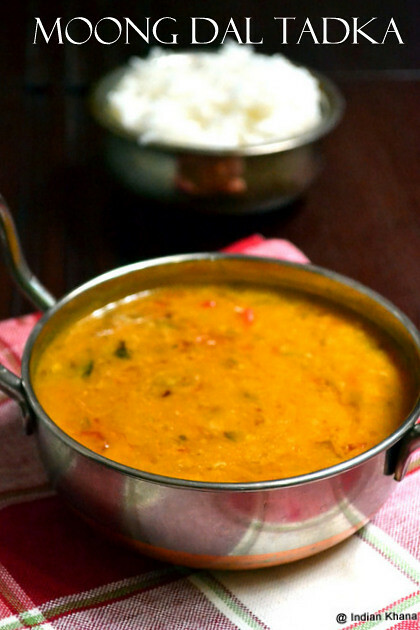 Though this dal very easy to prepare but it taste delicious with plain steamed rice or roti, even a side dish is not really necessary. I do this when I am in hurry or have no mood to cook which becoming more and more these days. I have used split green gram dal but you can use whole green gram too in that case soak the dal as it takes longer time to cook. Try this simple day and you going to love it. 1. Slice onion, tomato, slit chilies. 2. 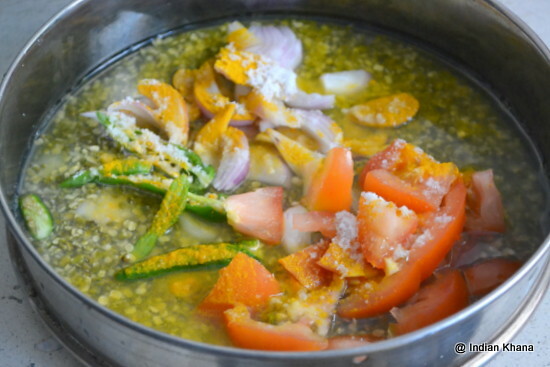 Wash dal, add onion, tomato, chilies, salt, turmeric & chili powder with enough water. Pressure cook for 3 whistles. 3. Once cooker pressure released, mash dal slightly and add 1 cup water. 4. In a pan or wok heat oil or ghee add hing, cumin seeds and allow to splutter. Add curry leaves, garlic and sauté until light brown. Add cooked dal mix and bring it to boil, adjust salt, water if required. Simmer for 2 minutes. 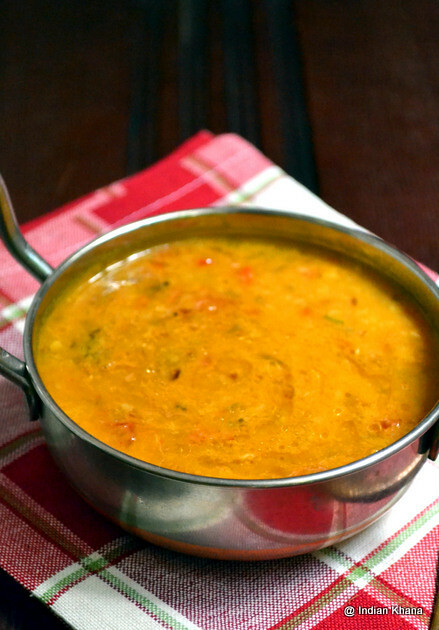 Our simple and quick dal is ready, add ghee on top for extra taste. 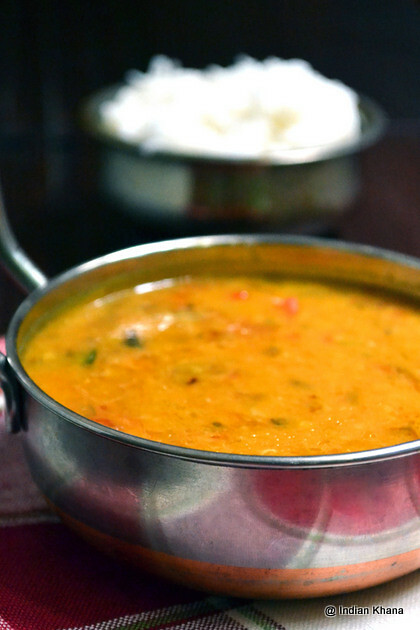 I can have this dal tadka with anything, inviting.